By the time author Michael Harris nears the end of his magisterial review of the strife and times of Prime Minister Stephen Harper, it is as if he felt the need of a shower. Almost 500 pages of Party of One: Stephen Harper and Canada’s Radical Makeover have by then been devoted to chronicling the Harper government’s bullying, abuse, duplicity, betrayal, affinity for crooks, public shaming of individuals, diminishment of democratic institutions. So in the last chapter he seeks figurative respite. He takes readers on a drive across the Canso Causeway to Cape Breton, N.S., and on to River Bourgeois, there to meet a man worlds away from officialdom, backroomers, talk show know-it-alls. He goes to meet Farley Mowat, then 92, in the last months of his life, yet sound of mind and opinion. “Stephen Harper is probably the most dangerous human being ever elevated to power in Canada,” Mowat tells the author. Harris presents a meticulously researched, deeply reported case for why Mowat was in all respects correct. “I think that (the Harper government) badly needed a rational critique in detail and I hadn’t seen it,” he says. Now we have one. And it may be that since Peter C. Newman’s landmark Renegade in Power 50 years ago there has not been such a comprehensive account of a Canadian government and critical eye cast on a prime minister’s poverty of spirit. 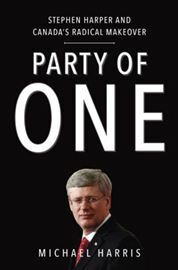 In fact, Party of One will likely stand as the definitive text on the Harper government, the go-to reference on every Ottawa bookshelf. Through his long career in journalism, Harris, now 66 and national affairs columnist for iPolitics, has been drawn to stories — Mount Cashel, Donald Marshall — of injustice and abuse of power. Again in this book, “that’s the No. 1 impulse,” he says. “A lot of the things that (Harper) was doing struck me as not only unjust but unjustifiable. It’s no accident that Harris opens the book with the account of a 22-year-old alarmed by the prime minister — former Senate page Brigette DePape, who famously held up a “Stop Harper” sign in the chamber during the 2011 Throne Speech — and ends it with 92-year-old Mowat basically expressing the same thing. In the chapters between, Harris provides considerable evidence to support their concern. He reviews the robocalls scandal, the Senate scandal, the muzzling of Canada’s scientists when their research posed obstacles to the government’s agenda, the kneecapping of independent regulators and arm’s-length officers of Parliament, the dismay of career diplomats to the makeover of Canada’s international standing. Some verdicts on the Harper government, coming as they do from those not given to such public judgments, are beyond devastating. “Canada’s diplomacy is hugely different under Harper,” veteran diplomat Paul Heinbecker, former ambassador to Germany, tells the author. “It is a reversal of our history. Harris lists the attacks on former Canadian Nuclear Safety Commission president Linda Keen, former parliamentary budget officer Kevin Page, former auditor general Sheila Fraser, the chief justice of the Supreme Court of Canada. “They wanted to do their duty and Stephen Harper wanted them to do what they were told,” he writes. With his government, normal constraints do not apply. As former information commissioner Robert Marleau told Harris, “when his government was found in contempt (of Parliament), Harper treated it like a minor, partisan irritation. Parliament is now a minor process obstacle. “Canadians are sleepwalking through dramatic social, economic and political changes surreptitiously being implemented by a government abusing omnibus bills and stifling public and parliamentary debate,” Marleau continued. Still, the most telling appraisals of Stephen Harper come, as is often the case, not from his political enemies but those, like former Reform party leader Preston Manning, who once admired and worked with him. In the end, the most chilling vignette in Party of One might be that provided by former cabinet minister Helena Guergis. In 2007, when Guergis and former MP Rahim Jaffer announced their engagement to caucus, there was a thunderous ovation. With one exception. Stephen Harper remained seated, staring.